In the early 1990's Greg Hildebrandt did numerous commissions for one of his collectors. Greg chose a different look for this painting, which is based off the original work created by Greg and Tim Hildebrandt in 1976. Greg never paints something exactly the same way twice, and in doing so, he chose to use brighter colors and a slightly different setting. This version contains numerous flowers and makes the viewer feel like they are a part of the scene! 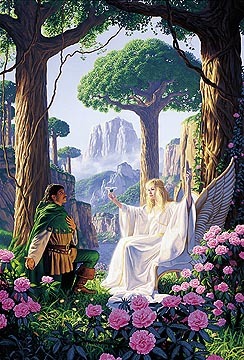 Created by Greg Hildebrandt in 1991. Signed by Greg Hildebrandt. We are selling this painting on consignment for one of our collectors.